The most important thing on your wedding day is declaring “I do” and dancing the night away—but the backdrop for all those romantic moments is important, too! If you’re dreaming of the perfect tropical nuptials, Enchanted Honeymoons can make your dreams a reality. An Omaha travel agency that specializes in paradise at the right price, Enchanted Honeymoons can help you plan a destination wedding that will be perfect down to the last detail. Our agents work closely with the best resorts in Punta Cana, and our planners are prepared to help you with anything from venue reservations to travel plans, and everything in between. Punta Cana is the picture of paradise! Stunning beaches, scenic golf courses, and luxurious resorts make Punta Cana a top destination in the Caribbean. With tropical surroundings and beautiful weather, a wedding in this coastal region of the Dominica Republic can be a romantic escape or a large celebration. Whether you’re looking for an intimate spot to tie the knot or a family-friendly place that will cater to all of your wedding guests, we can help you find the right resort for your wedding party. Luxury is the name of the game at these resorts, where everything is taken care of from check-in to check-out. You and your guests won’t be expected to pay for food or drinks on-site, which gives you the opportunity to really relax and enjoy your trip as you prepare for the big day! Punta Cana is home to many all-inclusive hotels, including the Hard Rock Hotel & Casino. Whether you want to jump into the nightlife at ORO Nightclub and the on-site casino, make the most of your time in the incredible spas and pools, or play a few holes on a Nicklaus-designed golf course—the Hard Rock has it all. Plenty of people can’t imagine a wedding that doesn’t include their closest friends and family. If that sounds like you and your fiancé, then Punta Cana has tons of perfect places for your destination wedding! Among the many family-friendly resorts in the Dominican Republic, Majestic Elegance stands out. In addition to an elegant and luxurious atmosphere that promises fun in the sun for all ages, brides and grooms reserving a certain number of rooms can get married on Bavaro Beach for free! For an intimate, elegant ceremony and stay, look no further than Punta Cana’s adult-only accommodations. These resorts cater exclusively to adult clientele, which means that your stay will be completely free of crying infants or splash fights in the pool (probably). If the idea of a mature and sophisticated resort strikes your fancy, consider IBEROSTAR’s Grand Hotel Bávaro. Between the prestigious and sophisticated on-site dining and live performances, a stay at IBEROSTAR’s Grand Hotel will be anything but ordinary. What wedding colors could be could better than sand white and ocean blue? A wedding ceremony on any of the beaches in Punta Cana is sure to impress. The tropical breezes and Caribbean culture will enchant your guests and ensure that your wedding day is unforgettable. Many resorts in the Dominican Republic offer free beach wedding packages for couples reserving a block of rooms. Ask your agent about the best package for you! Of course the ceremony is the main event for you and your guests, but what about after the cake is cut and the night has been danced away? In Punta Cana, there are exciting options for everyone. While hotels offer their own shows and concerts, the nightlife in Punta Cana is not restricted to the resort! After a day soaking up the sun, experience the amazing club scene Punta Cana has to offer. Let your hair down at Montecristo Cafe, Imaginarium, or Discoteca Mangú! Wherever you choose to stay, you’ll be close to plenty of hot spots. Punta Cana is studded with famous golf courses, ready to offer you the most scenic rounds you’ve ever played. Several of the courses were designed by professional golfers, and some are amenities offered at specific resorts. Punta Espada Golf Club is designed so that golfers of all skills feel at home, whether you’re world-class or you prefer putt-putt. If a day out on the links appeals to you, your only problem in Punta Cana will be deciding which course to play first! 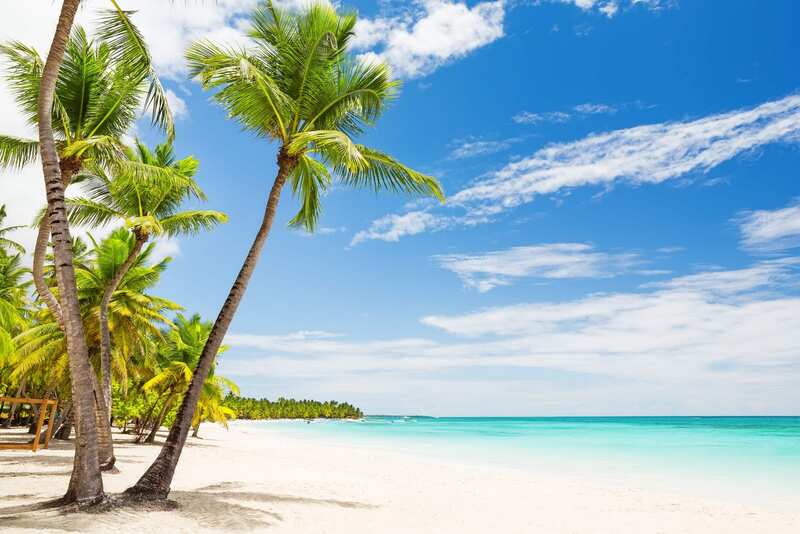 The Dominican Republic boasts not only beautiful beaches, but also coral reefs, waterfalls, jungles, secluded islands, pine forests, and the highest peaks in the Caribbean. Here are a few of the many options for taking in the local landscape and attractions. A horseback ride will lead you to Fun Fun Cave, one of the largest caves in the Dominican Republic. With a river nearly five miles long, and cave paintings, stalactites, and stalagmites to admire, there’s plenty to explore in this unique natural attraction in Los Haitises National Park. This park, which offers guided eco-tours, features 12 natural lagoons and hundreds of species of exotic plants, birds, reptiles, and insects. If you’re looking to add a little adrenaline to your outdoor adventure, consider ziplining—there’s no better way to see the scenery! If heights aren’t your thing but you’d still like to get in the thick of it, there are a number of companies that offer “jeep safaris” for those looking to immerse themselves in the natural environs of Punta Cana. History buffs won’t want to miss the House Museum of Ponce de Leon, a palace-turned-museum that de Leon actually lived in with his family before exploring North America. Are you ready to say “I do” to your dream wedding in the Dominican Republic? Call Enchanted Honeymoons at 402-281-3022 to speak with a travel agent who is ready to make your wedding day as magical as can be. Learn more about Punta Cana wedding packages and travel options, and get to planning to your perfect day!